How Much May a Canadian Exempt From the US Estate Tax? Currently (2018), US citizens and residents can exempt approximately $11.2 million from their US estate tax computation (but note that this figure will revert to $5.5 million in 2025 unless extended). That’s a good deal for most Americans. But on the other hand, they are subject to the US estate tax on the value of all their assets held anywhere in the world, not just their US assets. In contrast, Canadians and other foreign nationals who are not residents of the US only include the property identified above in their US estate tax calculation, not their globally owned assets. The downside (and it’s a big one) is they can only exempt $60,000 from the taxable estate, not the $11.2 million available to US citizens and residents. Accordingly a Canadian who dies with a $250,000 vacation house in the US is potentially subject to an estate tax based on the value of $190,000 in assets ($250,000 – $60,000). At the 40% estate tax rate, that could lead to the Canadian executor having to pay $75,000 or so in US estate tax out of the estate. Proper estate planning for the Canadian’s US assets can often avoid this situation. But if it’s too late for that, there is another line of defense: the favorable provisions of the US-Canada Tax Treaty. Fortunately the US-Canada Tax Treaty offers relief to some Canadian estates. 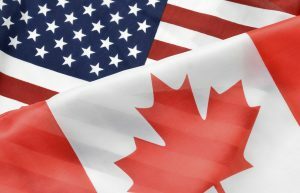 The estate of a deceased Canadian may invoke Article XXIX(B)(2)(a) of the treaty, which states the deceased Canadian may exclude an amount from the US estate tax based on a pro-rated formula. The formula is: $11.2 million (the US exclusion amount as of 2018) x (the value of Canadian decedent’s US assets divided by the value of the Canadian decedent’s worldwide assets in US dollars). Let’s say the worldwide value is $1 million in our example. Accordingly the Canadian fiduciary can exempt $2,8M [$11.2M x ($250,000/$1M)]. This amount is well above the $250,000 in US assets included in the decedent’s taxable estate for US estate tax purpose. The result is, no US estate tax are owed. But the executor has to invoke the US-Canada Tax Treaty to get this benefit. It isn’t automatic. The US-Canada Tax Treaty offers other significant relief to Canadians. In particular, if the estate plan leaves the US assets to the decedent’s spouse, the Canadian estate gets something like the equivalent of the unlimited marital deduction afforded to US citizens. The unlimited marital deduction allows a US citizen to give a US spouse a testamentary gift worth an unlimited value with no estate tax applied. Thus, if Bill Gates leaves his wife $100 billion when he dies, his estate will pay zero estate tax on that gift. Quite a benefit. The US-Canada Tax Treaty provides for something like this for Canadians who leave their US assets to a spouse. It’s not a deduction, but a credit, but in most cases, if the estate plan for the US assets is set up properly, it results in no estate tax on US assets left to a spouse. But again, the treaty has to be invoked in a cross-border probate for this potentially important benefit to accrue to the Canadian probate. The executor must oversee the completion of the IRS Form 706-NA (the nonresident alien estate tax return). This is the US estate tax form which must be filled out for executors of non-US citizen residents who die with US assets. But (and here’s the key part) the executor must also ensure that attached to the back of the Form 760-NA is an IRS Form 8833. This is the IRS form which must be completed to take a treaty position, any treaty position, so it’s a good form to get to know if you are an executor of Canadian estate that holds US assets subject to US estate tax. Filling out the IRS Form 706-NA without the Form 8833 could lead to the estate owning significant US estate taxes even though not a dime was owed. The key point is: Canadian executors administering US assets in a cross-border estate administration must take pains to properly understand the benefits of the US-Tax Treaty applicable to the estate, and then follow the proper procedure to invoke them. The treaty protection does not happen automatically. Finally, non-Canadian foreign nationals need to be extra vigilant. Only a few US tax treaties with foreign countries include the favorable estate tax treatment described above. For most foreign nationals, careful, creative estate planning for their US assets is doubly important to minimize their US estate taxes. Manes Law offers world class expertise in estate planning and probates for international clients who own US assets, with an emphasis on Canadians owning vacation homes. Learn more at our website: www.calresidencytaxattorney.com.